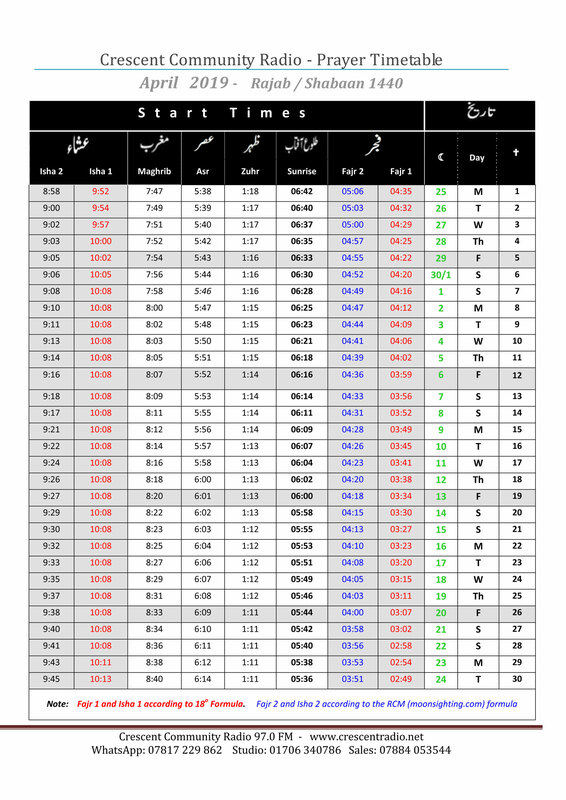 I think you should have a namaz timetable on the website as it would be very helpfull and convenient. I find crescent radio fun, lively & educational! Just wanted you to know a couple of years ago, I spent the majority “Month of ‘Ramzaan” with my elderly parents accompanied by Crescent Radio at Sehri time without fail 10/10 to the presenters. It was the best Ramzan ever, spending time with my parents and discovering Crescent Radio. It was so o o entertaining with lots of wit and of course educational The naat request was always kohie nabi say ah na saka, now every time I hear this naat it takes me back to a happy & priceless time. My Parents enjoy the radio station too and are regular listeners. Well done Crescent Radio keep it up. On Tuesday 8th November – Raheel Shah presented “UK ki kahani” which was a cracker. Unfortunately i missed the beginning of it, could you replay it and could you let me know when? Also are you able to sell that as a recorded cassette. I’m sure it will be very popular. Generally i listen to Crescent Radio all the time, it’s fab keep up the good work and please play some naats from Shabaz Qamar Fridi during morning drive time show. No.. unfortunately, we’ve not got plans to re-sell our playlist or other content that we play.. too much work! Many thanks for your reply. I look forward to the replay of UK Ki Kahani. I know what you mean about our website.. it is in the process of being ‘upgraded’ and amended on a weekly basis now. Things should start inproving soon. Regarding playlists, we will look into this, but might be tricky with regards copyright etc.. I was a regular listener of Crescent Radio. I still tune in every now and again but your slogan “The sound of Islam on the Airwaves” is not valid any longer. It is a community radio and you are now presenting diverse range of programs including musical ones. I do not believe you are portraying a good image of Islam by having your main slogan as this is an Islamic radio station. I do appreciate your work and hope that you continue but would be glad if you could give some consideration to review you slogan to reflect the reality. This is not a negative review and i hope you will publish it. can juma namaz be read at home? Assalamu alaikum. Jummah salah is only read at masjid, you will read dhuhr at home. Hope that helps. Salaam and Ramadan Mubarak to everyone. However I am very disappointed and upset that yet again we have failed to unite as Muslims. Yet again we have moved ourselves away from the teachings of the Prophet Muhammad (pbuh). You people make up your own rules as you go along to suit your own needs. If you cannot accept what Saudi says when Ramadan is why bother to agree when Hajj is? No doubt this message will be deleted but I’m only speaking the truth. Something that needs to be addressed to all the fake movies!!!! Wa alaikum salaam brother. It seems we have this discussion every year and we descend to name calling and insulting allegations (you people make up your own rules…). I went through similar doubt and confusion in the mid 90s but i thought i would look into the situation in details and look at the issues seriously by doing months of research and buying a number of books on the issue. I’m not going to reply to your message in detail and hope you take the effort to look into the issues a little more dispassionately. I will however correct you on the issue of Hajj. For those who are in Saudi for the Hajj must off course follow the authorities and accept whatever sighting the authorities decide upon. However it is not incumbent on those of us outside Saudi to follow them and we should do our own moon sighting and start Dhull Hijjah on a different day if that is what the moon-sighting dictates. Here is a link to a detailed website with a number of disfferent SAUDI SCHOLARS who say that it we should not follow Saudi moon-sighting EVEN FOR HAJJ! Click here. Ramadhan Mubarak to all our listeners! Assalamu alaikum. We are aware that this occured yesterday and it has now been fixed. Jazakallahu Khaira. keep your eyes open ….the world is full of dangrous people…so watch yourself..
Ramazan Mubarak to all those Muslims out there who are fasting or making intentions to fast. Inshallah, May allah make it easy for all of us and help us get through the day. At iftar time darood e taj by qari sa’d kazi is played, but who recites the english translation straight after? I cant seem to find it? Very proud of both Raees Khan and Riz Khan for being on air 24 hours for a good cause. Very inspirational guys. I’m a new listener of Crescent Radio and you guys are fantastic to listen to. I will be following, to see how you guys get on. Hold on and keep up the good work. Hello, I couldn’t find any email address for Crescent radio on this website so that I could send a private email? Or you can even email us for feedback on feedback@crescentradio.net. You can try either of those emails depending on your comment. Jazakallahu khaira. Please all Muslims pray for the little girl missing in Wales, also Muslim brothers and sisters pray for her safe return at jummah prayers please. Children a precious to Allah no matter what race or colour. Assalamu alaikum. We’re sorry to hear that brother Ibrar. Any news on your little girl? We pray that she is found and is returned to you quickly and safely inshaa’Allah, ameen. Jummah Mubarak to you too Ali! Have you got problems with the facility to listen online? I have been trying so hard with no avail. We are looking into it. Thanks. Please get in touch with me soon. Thank you for playing wonderful music on your program. Keep up the good work. I’ve set my alarm for every wednesday evening for listerning to your program.